Some of you may remember that line from the movie, Field of Dreams. We at Stamford Tent & Event Services build some of the most complex and well built structures, floors and stages you will ever find, complete with HVAC, lighting and more. Our customers, who we appreciate so very much, continue to come to us and value our quality work. Just as with many companies in most industries the credit often goes to the ‘customer-facing’ employees and that holds true for us. 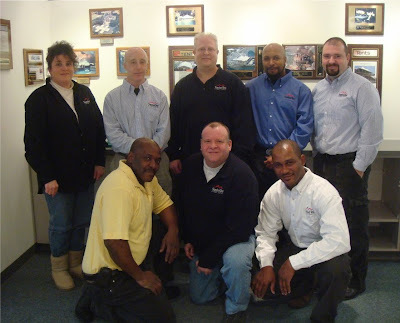 Our Rental Consultants along with President and owner Steve Frost and our installers on-site, always receive the credit first hand from our clients. With this blog entry, I would like to introduce you to some of the people who work diligently behind the scenes every single day, producing excellence for our customers, but simply due to their roles aren’t always recognized for such success. I’m referring to our Production Management Team. Brian is the conductor of this finely tuned orchestra. For 12 years, he has been a tireless worker committed to the success of our company. Starting in Sales and working his way through Production to his current senior management role, Brian drives the entire operations process from each project’s conceptual stage with our Rental Consultants, to pricing, planning, installation, removal and every step in between including equipment, warehouse operations, budgeting and more. His knowledge of this industry and all things involved in constructing safe, effective structures is truly uncanny. His work ethic, dedication and success have led to owners Steve and Tim Frost welcoming him as a minority stakeholder. I’m proud to work with the “Rainman” everyday, a moniker I have chosen because of his ability to solve mathematical calculations in his head, that I stumble with while using a calculator. Clive has been with Stamford Tent & Event Services for 20 years. Ask him about a project 18 years ago and he’ll tell you how high the grass was on the northeast side of the property in front of the stonewall which extended for 17 feet ending at the enclosure for the reflecting pool, then go on to tell you every other detail about the job if need be. Amazing. Clive has taken the ball from Brian and runs with it like a Pro-Bowl running back, coordinating the Production Department. From hiring, training, scheduling and supervising our installers, effectively scheduling all crews that leave our building, to overseeing every project from initiation to removal, Clive takes an immense amount of pride in his work and it clearly shows every day. Todd has been with Stamford Tent & Event Services for 8 years and excels in several roles. Todd interfaces with our Rental Consultants to ensure that all files are accurate and complete. With that information at hand, he maintains the crew schedule to ensure that all necessary equipment is available and structures this effort to ensure the availability at each job, making certain this is communicated to Rental Consultants and the rest of the Production Team. His display of outstanding organizational skills helps keep the department running like a well-oiled machine. With 34 years experience at Stamford Tent & Event Services, Tim is a second-generation owner of the company and has performed just about every role possible. As a current member of the senior management team Tim is tasked with facilities management, quality control, safety and loss control, truck fleet management as well as the sales of new and used equipment. One of the finer people you’ll ever come across, Tim is committed to the success of every department and it shows with his attention to detail along with every interaction he has with fellow employees. On the rare occasion that Tim isn’t working, chances are that you’ll find him on any number of hiking or mountain bike trails or camping under the stars. An outdoorsman indeed! Traci has been with Stamford Tent & Event Services for 10 years. She ensures that all of our projects have the appropriate permits, expediting payment based on each individual circumstance. It is at times a thankless job when interfacing with building inspectors and fire marshals across the northeast. This role is of utmost importance, ensuring the safety of our clients and their guests, making certain all bases are covered in order to avoid instances where structures do not meet code determined by each town’s ordinance. In addition, Traci wears several other hats within the Production Dept, an integral part of the team that makes everybody else look good by ensuring our events come off without a hitch. Danny has been with Stamford Tent & Event Services for 16 years and is in part responsible for our vast warehouse. He makes certain the trucks are loaded with the proper equipment in the most efficient manner for the crew and on the opposite side of the job, for its safe return and placement back at our facility. Danny is tasked with purchasing equipment, repairing/replacing damaged equipment and organizing the inventory. He also motivates the crew each morning, ensuring quality at the job sites and lending a hand if necessary. Last week the battery in one of our trucks died and we needed to move it from one of the warehouse bays. So Danny picked the truck up, put it on his shoulder and carried it to the other side of the lot. Ok, that’s not entirely true…but don’t challenge him to do so, because I wouldn’t put it past him. Tom (Moose) has been with Stamford Tent & Event Services for 15 years. He started as the Linen Manager and took over the entire Fabric Department in 2005. Tom is responsible for all of our tent fabric including tops, walls, liners, gutters, weight covers and all other miscellaneous fabric products. He is the man who makes sure our fabric is clean and of the highest quality when it arrives at our jobs because our customers expect such…and Tom makes sure we deliver. If we need a custom gutter created or a sidewall made to spec, Tom’s our man. Edgard has been with Stamford Tent & Event Services for 7 years. He works in tandem with Danny Davis, ensuring the flawless operation of our warehouse and crew. His responsibility ranges from employee time management, making certain the loading and unloading of trucks are done in an accurate and time efficient manner, to inventory, site visits and equipment management. Edgard is an extremely valuable member of our team and is largely responsible for the excellence we strive for on a daily basis. So there you have it, our Production Management team. Aside from the amazing experience and longevity of this entire group, the quality and pride they all take in their work is remarkable and largely the reason that Stamford Tent & Event Services has been known as the most detail oriented, highest quality, most professional tenting company in the industry. When failure is never an option and anything less than excellence is not acceptable, it’s only a team like this that helps make it all possible.